Kitty cats, to your left do yourself a favor and take a gander at Frye’s glorious 12R Leather Riding Boots; to your right allow your eyes to gaze upon the magnificence that is Mossimo Supply Co.’s Katherine Leather Engineer Boots. 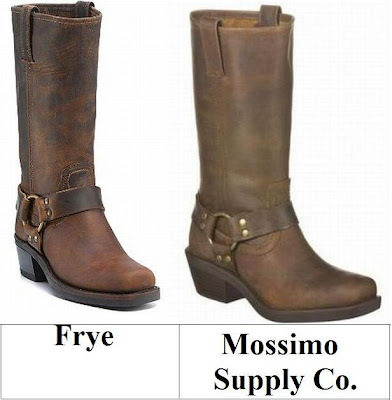 While the Mossimo marvels are a slighter lighter shade of brown than the fantastical Frye’s; for a mere $49.99, in comparison to the $218.00 needed to make Frye your own, they feature the very same sophisticated cowgirl aesthetic of the originals, at a price that is far more pleasing for the budget fashionista’s pockets! What’s your bank account telling you to do, kittens? Will you be a big spender with Frye, or play the role of the thrifty fashionista? They look so alike! Definitely have to save on this one! so alike <3 you're so good!! Oh..so much a like. Really. My bank account isn't made for expensive boots though. & I think Target will do me just as well. So nice to know this information. what did we do before target ever existed??? have a nice sunday! So amazing. Thank goodness for Target. Definitely, think the thrifty one will hold up to the elements. I loved my boots I got from Target last year..and they are still ready for another year. Oh I want the Frye ones badly! I am a total sucker for Frye, so I'm going to have to be a big spender on this one, darling! I'll try the Target ones! I love me some Frye but I'd go cheap and go with the Mossimo! Wow, those boots are something else. Love the Target ones! I love the Mossimo version of the boots. There were also boots like those at Payless. I'm going to be thrifty here and maybe splurge on a couple of pairs. Hope you have a good Sunday. Nothing says it's fall than a great pair of boots perfect for jumping into a big pile of leaves. These are so great! I have been wanting a pair of boots like that for a while now. I'm so excited that I can actually afford some now!! :) Thank you!! <3 your blog!! Love this look, there's nothing like a pair of Frye boots. Love them both. My pocket prefers the cheap ones though. Take care dear. I'd kind of been wanting some boots like this, but I didn't really want to splurge on Frye's. So thank you! Ahh love both of these boots! I have so many darker ones, I'm in the mood for some browns ... and I'm going to ignore the $218 price tag and go for the Frye ones :) Hope you've had a great weekend! I am soooo going to Target! I love that store- and their shoes last forever! Both pairs look great! But I think I'd go for the Frye just because I'm sure they're a better quality than the Mossimo pair. Plus, I always hear such great things about the Frye boots! The Target pair is totally worth it! They look like the Frye's but I think they're actually a little more comfy and a little less clunky! They're very similar, but there's just something about the Frye ones that I loke more! I love Mossimo! He makes the cutest stuff, for the greatest prices. I've been looking for similar boots for so long. Great picks. I think the Frye pair have my heart! What a find. I would definitely go for the cheaper ones (if I could fit any more shoes in my wardrobe). ooo, I like the Mossimo one but I would go Frye today! $218 dollars isn't that bad for a well-made boot!!!! Riding boots are the most perfect boots ever!! I love both of these. I simply can't choose. Frye ... defiantly. Nothing fits or lasts like Frye boots. Erika, I friggin love you even more! You found the perfect replacement boots for me! Mine are falling apart, these are perfect! Really great find! Happy Monday! I would love it if you helped me find a cheaper alternative to the JCrew boots I posted on Friday. I love them, but at $350, they're a little over my price range. Erika. It's official. You are the queen of boots and boot finds. This is a serious jackpot!! I'm going to have to go with the Frye boots on this one! I just think the material is so important on these boots. Love them! I love them both, but, since my wallet wears the pants in this relationship, I'll have to go with the Mossimos. Which is not that much of a loss, as they are simply adorable! those look darn close - I have the Frye's and seriously thought you flopped the pics by accident! WOW! Fryes are such a steal for 50 bucks! Just what I maybe needing! I love these boots!!! they are amazingly stylish!! I'm torn! I just love Target, but ooooh, Frye makes the best boots ever!